If you are an outdoorsman who likes to embark on adventures, you will probably love the goTenna. This little device can be strapped right onto your backpack to create a mobile network that enables cell phone use. Consider the many reasons why you might need to use your cell phone while exploring nature’s beauty. You might lose your way and desperately need assistance from emergency personnel. Or maybe you just want to reach out to your significant other to paint a visual portrait of the glorious scenery. Such communications are made possible when you have a goTenna strapped to your backpack. The next time you head on out to a remote area, pull out your cell phone and see how many bars appear. When you venture to such “off the grid” locations, your cell phone almost always loses reception. The goTenna ensures that such a predicament will never happen again. This nifty little device doesn’t rely on satellites. It functions by pairing to Android or iOS phones and tapping into a special app along with a digital radio signal to create its own mobile network. As a result, you can text, call and share content with your cell phone just like you would in a city or suburb where there is perfect cell phone reception. 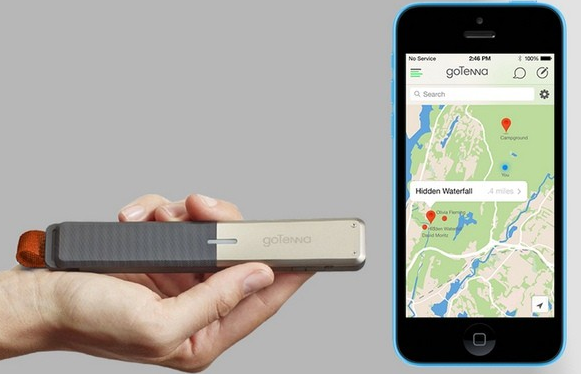 The goTenna really is the perfect invention for men who love exploring the greater outdoors.